Saw these on a Crew Chief page I'm part of on the Facebook. 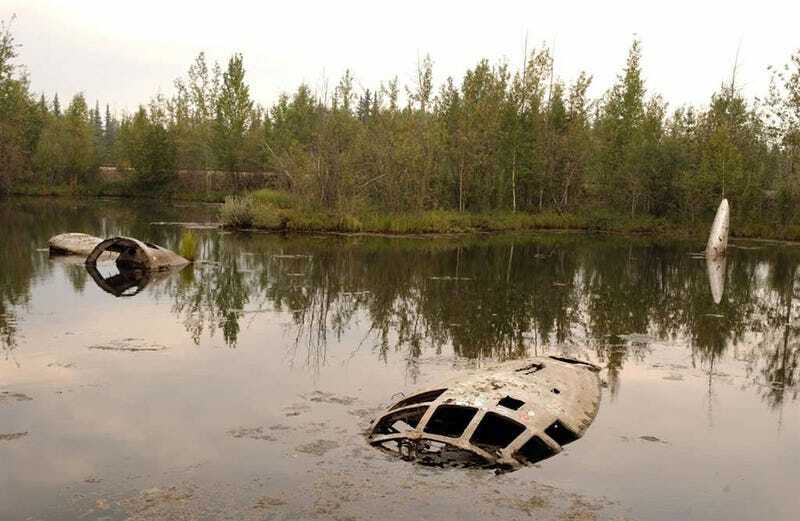 The Lady of the Lake is purported to be either a KB-29P that had a nose gear failure on landing or a WB-29 that was cannibalized to condemnation in 1955/1956. During that time frame, the USAF was getting rid of the B-29 and moving to the B-50 (a larger version of the 29). Either way, since it wasn't going to be flown anymore, it was towed to a small pond at or near a gravel pit on Eielson AFB, AK in order to practice water extraction of aircrew. Now, either the water level rose too high, or the plane sank in the mud, but it became too dangerous to continue training using the Lady. It still sits in the lake and can be viewed by anyone with base access. Disclaimer: That's not me in the last pic.